Today’s book review was suggested by Nick M., and it’s an unusual one compared to what I usually cover. It’s called The Book of Beasts (TBB henceforth), subtitled Color and Discover (or Colour and Discover on my copy… #oldworldthings) and it’s a coloring book if you hadn’t figured it out yet. Apparently coloring books are all the rage these days, even where I live, and this is the only coloring book I know of that doubles as a bestiary. Well, okay, there’s Crayola Color Alive: Mythical Creatures which was xmas-gifted to me by one of the most awesome people in existence, but that doesn’t count. It can be bought online here and here. TBB is first and foremost a coloring book, meant for the reader to fill in with colors of their own choosing and colorize their worries away. It is not a comprehensive encyclopedia of mythical creatures nor does it claim to be. 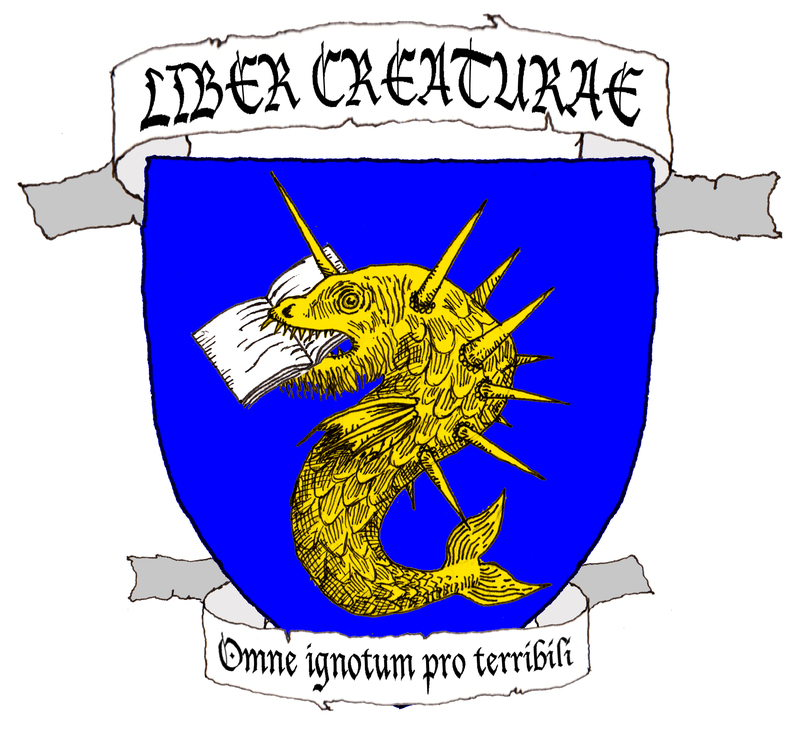 It does have “over 90 creatures”, which is pretty impressive, and while they include the usual suspects from Classical/European mythology, there are still a good amount of worldwide creatures: Impundulu, Ahuizotl, Kongamato, Baku, Ifrit, Mongolian Death Worm… Even if you’ve given up on “mainstream” teratology books, TBB makes its own niche by being a DIY bestiary. Earth, Wind, Water, Fire – these were the ingredients chosen to make the perfect little girl four broad chapters, with creatures sorted based on the classical elements. It’s an arbitrary classification scheme but it works. TBB doesn’t have to worry about categorizing hundreds of massed monsters, and the elemental division makes it tempting to hew to specific color schemes. Besides classifying things as “fairies”, “demons”, “spirits” etc. is arbitrary anyway. No complaints here. Each page has creature images on one side and text explaining them on the other. Not too detailed, but just right for a coloring book. That also prevents the text from getting too egregiously inaccurate, but the Peryton is still in there as a “real” thing. Sigh. I haven’t tried coloring anything yet (I’m sure my readers would much rather I stick to coloring creatures for ABC), but going by Amazon reviews marker coloring will bleed over and mess with the text side of the page, so stick with coloring pencils or other nonwatery media. Lovely line art by Angela Rizza, with plenty of detail and greebles to keep colorists happy for hours. Rizza’s work is excellent, with some really good takes on some of the creatures – I especially liked the footballfishesque Charybdis, the serpentine Cherufe, the bestial Ifrit, the various wonderfully reptilian dragons… I am, however, going to quibble about the Ziphius, which clearly looks more like a Trolual. The final quality of the images depends on how good you are with coloring pencils. The cover is a very pretty foiled gold, but it seems to be coming off on my fingers as I hold it. Handle with care. No bibliography, no shoes, no service. This is a book that will live and die as a coloring book. If you have no love for coloring books, then you should probably look elsewhere. If you are looking for a coloring book and like mythical creatures (and if you’re reading this, you probably do), then TBB is a fine addition to your collection. If ABC doesn’t kill me I’ll be coloring my copy in someday.